Connolly arrived on P.E.I., according to one chronicler of his life, "without money, friends, or influence." "The storekeeper still maintained personal contact with his customer by catering to him over the counter, weighing out a couple of pounds of sugar, salt, oatmeal, beans, prunes, raisins, etc. ... The days were full as we seldom closed the store before eleven o'clock at night." This biography is used with permission and was written by David Cousins, through the project Some Island Entrepreneurs, led by the Institute of Island Studies at UPEI. Follow the link to read more biographies on-line. Owen Connolly was born in 1820 in the town of Donagh, County Monaghan, Ireland. He came to Prince Edward Island in 1839 at the age of nineteen. He was one of the thousands of Irish immigrants, chiefly from the County of Monaghan, to arrive on Prince Edward Island in the 1830s and 40s, seeking relief from the poverty, overpopulation, and inequitable land system of their homeland. He arrived, according to one chronicler of his life, "without money, friends, or influence," a circumstance familiar to many Irish immigrants at that time. What he did have was a great deal of cleverness, business sense, and a generous personality, characteristics that would grant him a unique place in the business history of the Island and make him one of our most important entrepreneurs. Connolly began his life on the Island as a farm labourer for a family by the name of Smallwood in Lot 48. He saved enough money there to buy his own farm on the Monaghan Road (now known as Watervale). He was so prosperous as a farmer that he was able send for his parents in Ireland and buy an adjoining farm for them. After his marriage to Ann Hughes, he set up a small store for the country trade. He operated this until 1852, when he moved to Charlottetown and established a liquor and grocery store and a short-lived shoe-making business on Dorchester Street. The business in Charlottetown was remarkably successful and, by 1860, he was so esteemed as a businessman that he was appointed Director of the newly established Union Bank of Prince Edward Island, which was later known as the Merchant's Bank of Prince Edward Island. 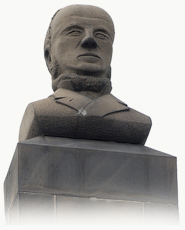 He also owned his own bank, as the first Island agent for the Merchant's Bank of Halifax. By the mid-1860s, he felt the need to expand, so he built a new store at Dorchester and Queen in 1864. Connolly's ventures were expanding in other ways as well, both in terms of variety and geography. He was unique in his ability to integrate successfully several levels of trade and commerce: he bought a wide variety of produce from local farmers, and supplied the rural market with a great deal of their household needs; he owned his own wharf, with three piers; and he owned several vessels for the shipment of produce to foreign markets and for supplying his stores. He was also becoming a prominent figure in the pork-packing industry, and claimed in his advertisements that he offered the highest price for pork by the carcass. His was said to be the largest pork-packing business in the Maritimes. In the 1870s, Connolly's commercial influence was felt throughout the Island. He had a network of chain stores, the first of its kind on the Island, with branches in several communities. He had an extensive business in Souris, with a large store established in 1877, as well as a lobster factory near the town. He was a major exporter in Montague, where he built several warehouses, one of which was described as "the largest building of its kind on the Island." He also owned a great deal of real estate across the province, which was summarized in an obituary as "some of the best buildings in Charlottetown, Souris, Montague Bridge, Cardigan and Summerside, as well as fine farms in Charlottetown Royalty, St. Peters, Morell and Lot 48." Connolly was renowned for his generous involvement in the life of his community. As an immigrant from Monaghan, he understood poverty well, and this was reflected in his acts of charity. In his later years, he distributed coal and blankets to the poor during the winter. His charity also reached across the Atlantic to his home country when he donated money to those areas that were hit hardest by famine in the 1880s. Connolly's largest act of charity was not known to the public until his death in 1887. In his will he instructed the executors of his estate to apply the remainder of his estate "for the purpose of educating or assisting to educate poor children resident in Prince Edward Island, who are Irish, or the sons of Irish fathers." The value of this estate was estimated at the time to be $250,000. The program for implementing this fund was established after a few years and was first applied to the support of several students of St. Dunstan's College. This was a tremendous help to the college, as well as to those students who otherwise would not have had the opportunity for such an education. Connolly's achievement as a business leader seems all the more remarkable when it is considered that he arrived on the Island penniless, and would eventually be hailed as the wealthiest man in the province. However, it was more than mere wealth that made him unique. Merchants like Connolly were an important part of the economic development of Island communities. They provided farmers with an outlet for selling their produce and gave rural families access to goods that could only be obtained from outside the province. In the process they did a great deal to generate economic activity on the Island and to lay the foundations for future business development. Connolly was especially significant in this way because he was involved in so many aspects of local commerce; and, in his determination to keep his business continually growing, he made a direct impact on the business life of many of the Island's communities. The largest secondary source on Connolly's life and business enterprises is a booklet entitled Owen Connolly, Esq. 1820-1887 (Charlottetown: Estate of Owen Connolly, 1977), written by M. F. Hagan by authority of the Trustees of the Estate of Owen Connolly. It provides a brief biography as well as a collection of advertisements, obituaries, and other newspaper articles relating to Connolly. Also useful is "Owen Connolly -- Benefactor," by John Mullally, in the St. Dunstan's magazine Red and White 44 (Spring 1953) 3:129-133, available on microfilm at the UPEI library, and now for viewing on-line. Edward MacDonald has commented on the importance of Connolly's charity to St. Dunstan's in The History of St. Dunstan's University 1855-1956 (Charlottetown: Board of Governors of St. Dunstan's University and Prince Edward Island Museum and Heritage Foundation, 1989). There are two collections of primary sources on Connolly to be found at the Public Archives and Records Office of Prince Edward Island. The Owen Connolly Collection contains an account book; plans of lots, buildings and estates; and various other business records. The Owen Connolly Fonds is the larger collection, consisting of extensive business records regarding the Charlottetown and Souris enterprises; records of the Estate of Owen Connolly; and some records from various other businesses that relate to Connolly. Owen Connolly was born in Ireland in 1820 and came to Prince Edward Island in 1839, at the age of 19.